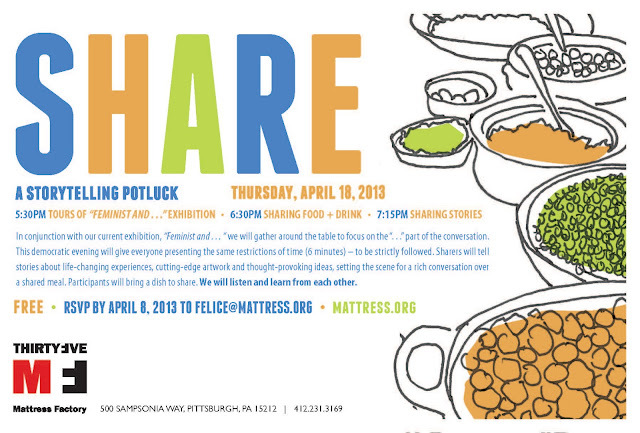 On Thursday April 18, the Mattress Factory will host SHARE: an evening of sharing food and ideas. This democratic evening will be held in conjunction with our current exhibition, Feminist And..., which presents new work by six women artists from throughout the world. The show’s curator, Hilary Robinson Ph.D, proposes that feminism is not a single-issue set of politics but rather a multi-vocal, multi-generational and multi-cultural evolution of thinking and practices. In that spirit, guests of SHARE will first tour the exhibition, and then will be invited to share food and drink. During the potluck, a predetermined group of sharers will begin telling stories about a life-changing experience. Each sharer will have 6 minutes to present. One of the evening’s sharers is Feminist And... artist Julia Cahill. Cahill is excited to be a part of an event that is both a casual potluck presentation and an open conversation with the community. She believes that, “this is the kind of event that needs to happen more often and among more communities. It’s important to have frequent dialogue with other artists or colleagues.” Cahill uses humor and parody to get her audience to reflect on how they are implicated in the issues raised by her artwork. She believes it is important that people are aware of current events, and she hopes that her audience leaves her work asking questions and having conversations. The audience for SHARE will also have the opportunity to converse after the presentations. The stories shared by presenters will set the scene for a rich conversation over a shared meal. With a metaphorical emphasis on the “. . .” part of the conversation, we will listen and learn from each other. SHARE is free, but registration is required by April 8, 2013. Please call (412) 231-3169 or email felice[at]mattress[dot]org to participate.